Imatest is a complex, rich application involving a great many image quality factors, modules, and test charts. The tables below, for Quality Factor, Module, and Test chart are designed to help navigate the site. A Table of contents is also available. Most test charts are available from the Imatest Store. Image quality factors have their own page. A brief list of recommended test charts is given in the FAQ. Dynamic range, Tonal response, Contrast Step charts Stepchart Transmissive charts such as the Imatest 36-patch Dynamic Range chart or the Stouffer T4110. Special charts: ISO-16067-1, QA-62, ISO-14524 OECF, ISO-15739 Noise, 20-patch OECF charts Stepchart Imatest Master only. Grid or checkerboard printable by Test Charts. Light falloff (uniformity), vignetting plain, uniformly lit surface Uniformity Best: Screen Patterns with LCD flat screen. L Printable by Test Charts. Some versions printed on photographic media. scanned on profiled flatbed scanner Print Test Gamutvision extracts these properties from ICC profiles. Modules are listed on the Tour page. eSFR ISO Sharpness (MTF), Lateral chromatic aberration, Tonal response, Lens distortion ISO 12233:2014 Edge SFR (E-SFR) chart Highly automated module: no manual ROI selection. Chart available from the Imatest store. module) Color accuracy, Tonal response, Contrast, Noise X-Rite ColorChecker, IT8.7, ColorChecker SG, Step charts, special charts: ISO-16067-1, QA-62, EIA Grayscale, ISO-14524 OECF, ISO-15739 Noise, 20-patch OECF charts Interactive module for measuring a large variety of color and grayscale charts. 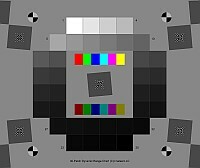 module) Color accuracy, Tonal response, Contrast, Noise Fixed (batch-capable) module for measuring a large variety of color and grayscale charts (all charts supported by Multicharts). SFR Sharpness (MTF), Lateral chromatic aberration Slanted-edge (printable by Test Charts), ISO 12233 Also measures Subjective Quality Factor (SQF). SFRplus Sharpness (MTF), Lateral chromatic aberration, Tonal response, Lens distortion SFRplus chart Highly automated module: no manual ROI selection. Chart available from the Imatest store. Stepchart Tonal response, Contrast, Noise, Dynamic range, Exposure accuracy, Veiling glare (lens flare) Step charts, Special charts: ISO-16067-1, QA-62, EIA Grayscale, ISO-14524 OECF, ISO-15739 Noise, 20-patch OECF charts Special charts in Imatest Master only. Transmissive charts such as the Stouffer T4110 recommended for DR. Dynamic Range (Postprocessor for Stepchart) Tonal response, Dynamic range Reflective step charts such as the Kodak Q-14/Q-14. Usually more convenient than Stepchart for measuring DR because it doesn’t require a transmission chart, special light source, and darkened room. scanned on profiled flatbed scanner Gamutvision extracts these properties from ICC profiles. This list is primarily commercially-available test charts. You can print out additional charts from files generated by the Test Charts module. Sharpness (MTF), Lateral chromatic aberration, Tonal response, Lens distortion SFRplus Available in the Imatest Store in several sizes, media (transmissive and reflective), and options (pre-distorted, etc.). Designed to measure several key image quality factors from a single image with a high degree of automation: no manual ROI selection. SFRplus operates interactively inside Rescharts or as a fully automated module with no user intervention. Has numerous advantages over the old ISO-12233 chart, listed here. Sharpness (MTF), Lateral chromatic aberration, Tonal response, Lens distortion eSFR ISO Available in the Imatest Store in several varieties, sizes, and media (transmissive and reflective). Designed to measure several key image quality factors from a single image with a high degree of automation: no manual ROI selection. eSFR ISO operates interactively inside Rescharts or as a fully automated module with no user intervention. Has numerous advantages over the old ISO-12233:2000 chart, listed here. Texture, Sharpness Random Available from the Imatest Store: Color, Monochrome. Imatest Master & Image Sensor-only. Color or Black & White available. Tonal response, Noise, Dynamic Range Available from the Imatest Store. Density range ≥ 3.4. Near-circular design minimizes effects of light falloff. Automatic region selection available. Much easier to use than other transmissive stepcharts. Multitest Available from the Imatest Store. Imatest Master & Image Sensor-only. Widely available; consistent pigments. A compatible chart is available from Danes-Picta. Dynamic Range Veiling glare is measured with “black hole” next to the Q-13. May be purchased from professional camera stores or Danes-Picta. MTF can be a check on the slanted-edge method; more direct but less accurate. Sharpness Star chart Imatest Master/Image Sensor-only. May be created for printing by Test Charts. Will be available on the Imatest store. Sharpness, Lateral chromatic aberration, Subjective Quality Factor (SQF) SFR Printed on high resolution photographic media. Slanted-edge charts printed on a high quality inkjets can perform the same function, but aren’t as fine. No longer supported in the ISO 12233:2014 standard. The SFRplus chart has numerous advantages, listed here. Multitest Imatest Master & Image Sensor-only. These images were put online for testing Imatest API/EXE, but they are generally useful for testing Imatest. This is not a comprehensive list of charts, which can be found in the above table. Webcam image of high and medium contrast custom charts created by Test Charts and printed on an Epson R2400 printer: these can have larger regions of interest (ROIs) than the ISO 12233 chart below. Webcam image of ISO 12233 chart. At this distance the available regions of interest are very small. Webcam image of the Kodak Q-14 grayscale and X-Rite ColorChecker. Image of the Stouffer T4110 transmission test chart taken with the Canon Powershot G2. Excellent dynamic range measurement. 12-patch OECF chart (for API and Imatest Master only ). Available from Imatest Store. Webcam image of distortion grid. Image of nearly uniformly illuminated surface taken with the Canon 10-22mm lens on the EOS-20D, f/4.5, 22mm, ISO 1600. Image Log-Frequency-Contrast chart (cropped), acquired by the EOS-20D camera, 24-70mm f/2.8L lens set at 42mm, f/5.6, ISO 100. Can also be used with Log Frequency. Slanted-edge MTF measurement. The calculation is derived from ISO-12233. The average edge is calculated using a 4x oversampling binning algorithm. MTF is the Fourier transform of the derivative of the differentiated edge (the average line spread function (LSF)). The Imatest algorithm is more immune to noise and lens distortion than the standard ISO algorithm, which can be selected in a checkbox if desired.